No shine maximum hold tape taps are specifically made for installing and keeping tape in hair extension in place. This tape with proper care will last for 4 - 10 weeks. Use this tape for all skin weft, seamless, weft and tape in hair extensions. 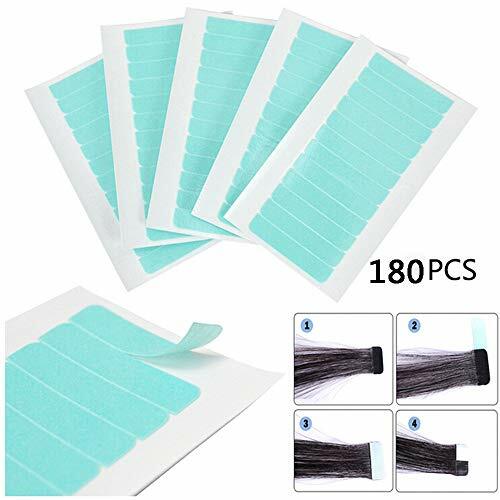 Clear, double-sided, medical adhesive tape in strips, used to hold hairpieces to the scalp. The back liner is slit for easy opening. Apply tape to the tape tab or perimeter of hairpiece. Can be applied to the entire hairpiece interior for a secure hold. AMAZING FEATURES SAFE INGREDIENTS Unlike other cosmetic adhesive products, Ghost Bond has been designed by experts who put your safety and comfort first. COMPLETE WATER RESISTANCE Never avoid making a splash again. With Ghost Bond, you can swim laps and dance in the rain without any embarrassing lifting or shifting. FASTER CURING Don t waste a minute waiting for your cosmetic adhesive to dry. You won t find a faster drying cosmetic adhesive than Ghost Bond. 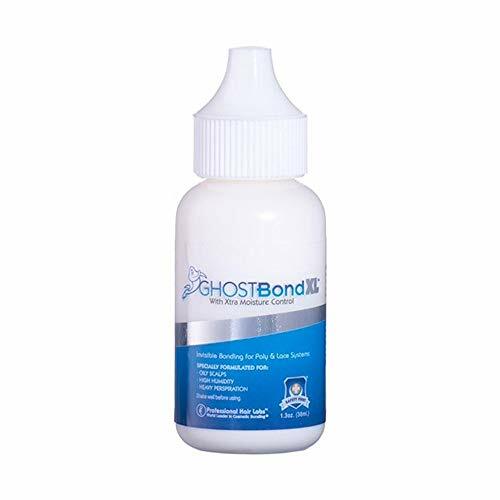 POWERFUL HOLD With Ghost Bond, you ll get the strongest hold available on the market today, without the irritating and harmful chemical adhesives in other products. TEMPERATURE RESISTANCE Soak up the sun with Ghost Bond s powerful temperature resistant design. Enjoy longer hours in the sun without lifting or having to reapply! BACTERIA RESISTENCE You deserve to feel, smell, and look clean at all times. With Ghost Bond, you ll be able to wear your hair system longer without having to worry about bad odors or harmful health effects. 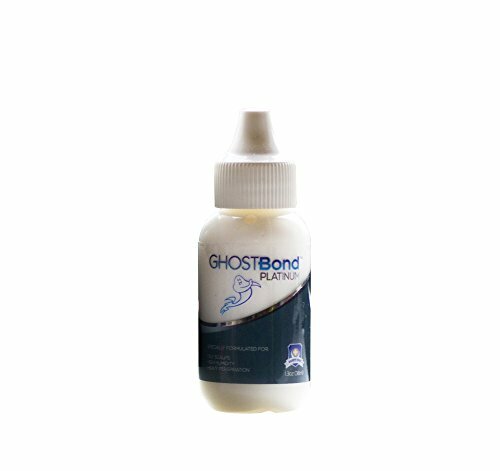 Ghost Bond Platinum hair replacement adhesive by Pro Hair Labs provides a strong bond with your skin with the need for less product than other brands. Proper care for a wig can help protect it's longevity and keep you looking great! 1. When you need to comb a wig, be gentle. Do not use regular brushes, and if you can, only comb it. It doesn't need combed every day, so let it rest. 3. After washing a wig, do not shake it in a towel. Be careful and dry it piece-by-piece. This makes sure that strands of fibers don't fall off. Also, never style your wig while it's wet. Even those wet-to-style hair stylers are known to damage your wig. 4. After saturating your wig in water, squeeze it dry. Don't wring it or the base of your wig could become mis-shaped and dry funny. 5. While washing your hair, never use shampoo meant for natural hair. Even though normal conditioner is OK, the shampoo is too harsh and can lead to hair falling out. 6. You can condition your hair every couple weeks or so, to keep it shiny and soft. Make sure you don't do that every day and be sure to rinse it all out or it could lead to build-up in your wig. 7. Only wash your wig after wearing it for 25 times. If you do this daily or even weekly, it can lead to your wig looking less realistic and falling apart. Please Feel Free to Contact With Us If You Have Any Questions! 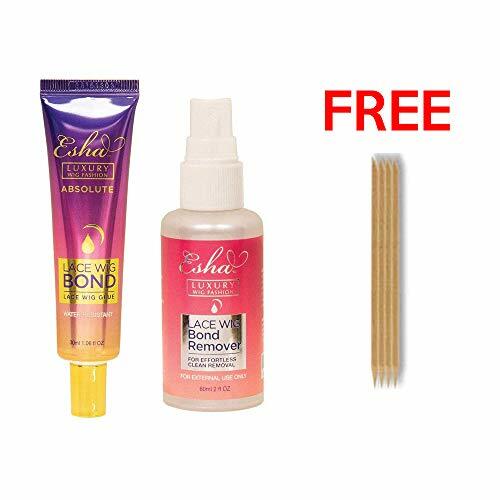 Free Gift Wig Cap , used to fix your own hair better. Tips: You can wash the wig when you receive the package and wait for it dry naturally, because after a long term transportation, there maybe some dirty in the fiber which makes some people feel itch. 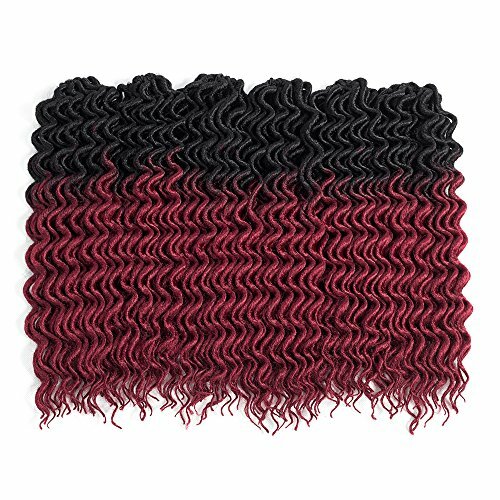 Perfect for Full Lace wigs, Lace Front wigs, 360 wigs . 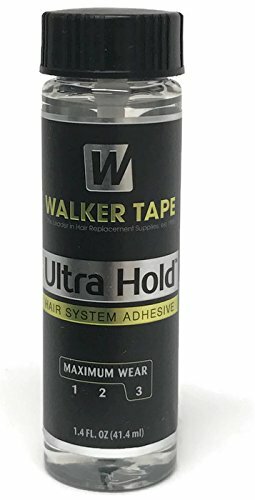 Walker Tape Ultra Hold Lace Wig Acrylic Adhesive is the leading standard for soft bonds on the market. Ultra-Hold is tried and true and still our most popular Maximum Wear adhesive. It is a rock solid choice for a long term hold. It dries clear, and stays strong! You're going to love Ultra-Hold. 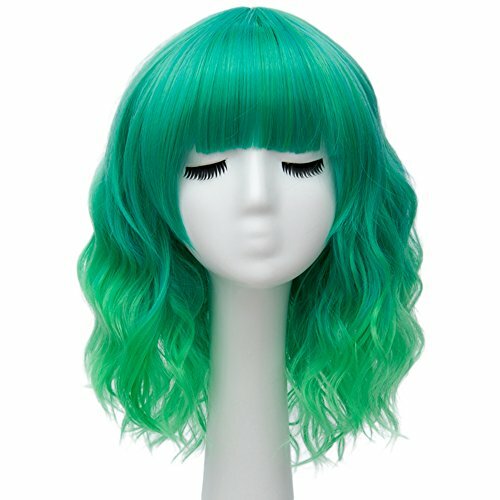 Water proof and safe for all lace wigs! Perfect for long term wear! When it comes to finding the best hair bonding glue, it's important to use a cosmetic bonding solution that allows you to feel truly confident in any situation. Our Ghost Bond XL Adhesive is specially formulated to provide exceptional moisture protection and has a higher melting point than other hair adhesive products to ensure comfort and hold strength at all times! Our Ghost Bond XL hair replacement adhesive creates a strong, invisible bond between scalp and hairpiece to reduce movement, while hiding the hairline and absorbing light for a natural appearance. Our cosmetic formula can be used for both poly and front lace hairpieces and is ideal for those with oily skin and scalp, heavy perspiration and those who live in high humidity climates! 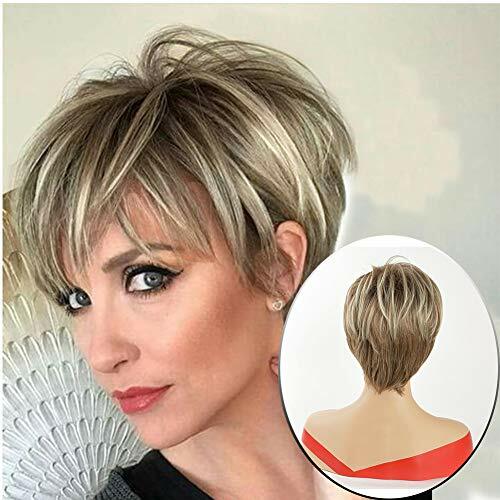 Peace of mind when wearing a wig or toupee comes when you're able to go about your day without worrying about your hair system moving or falling off. Our Ghost Bond XL bonding glue is waterproof and oil-resistance so that you can enjoy being in the moment, instead of being focused on your hair. Ghost Bond XL: Our Ghost Bond XL Adhesive is specially formulated for use as a pressure sensitive adhesive and glue for bonding hair replacement systems to skin and scalp. Our products are researched, manufactured and rigorously tested to ensure high-quality, exceptional performance and safety. 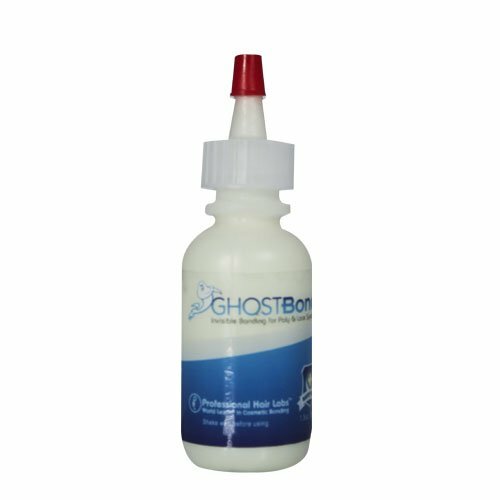 Ghost Bond XL Adhesive is safe for use on both poly and lace hair replacement systems and creates an invisible bond after application. This invisible bonding helps to hide your hairline and creates a natural look for your wig or toupee for both men and women alike. 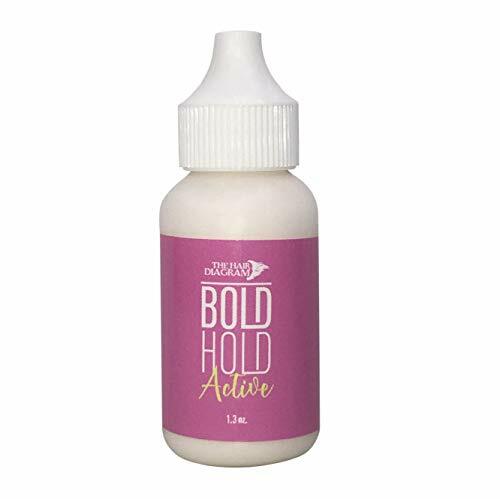 Ghost Bond XL Adhesive by Pro Hair Labs is specially formulated for those with oily skin and scalps, heavy perspiration and those in climates with high moisture and humidity. Our formula also has a higher melting point than other polyurethane and lace front wig and toupee glues, enabling you to rest easy that your hair will remain in place. Directions: 1. Wash and deep condition hair regularly. 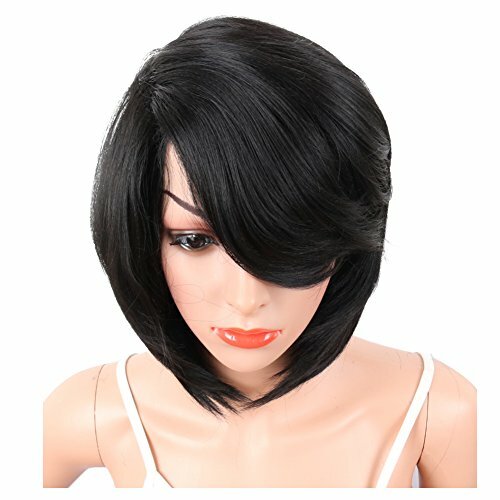 The wigs stylish design with natural looking and soft touch. You can wear it to parties or for daily use. It is suit for your wedding &graduation ceremony, vacation & party attendance, family & friends gifts and so on. Fast and safest shipping Calculate your shipping cost by country/region and quantity. Wig Storage:The best way is on a wig stand or mannequin, also you can store it in a hair net and plastic bag. Please note wigs should be placed in a cool dry space. The color might be slightly different due to Material, Shooting Light, Camera Pixels and Personal Understanding of Color Difference ,the picture is only for reference. The product may be squeezed during transport, but don't worry ,it will become what you want after taking a little care of it . Have a nice shopping day! Cap Size: 20-22 there are two adjustment straps inside the wig, can be adjustable by adjustable straps to fit amount of people, if you need tne special size, please kindly let me know. 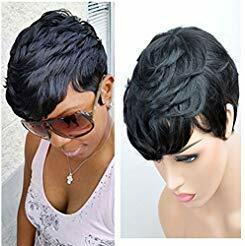 If you have sensitive skin, please be aware of using the synthetic wig may will leads to dry, hot or itchy scalp, so please make sure if you are allergy to wigs. 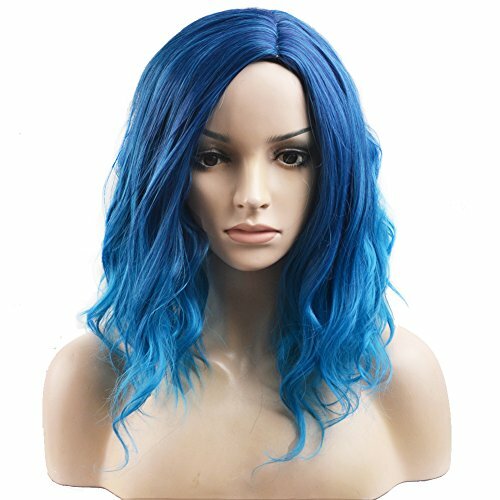 Know More about Our Wigs Before Your Purchase, Enjoy Better Shopping Experience. *All products are returnable and you can enjoy 30 days free return or replacement against from man damage. All products are brand-new from us, please contact us immediately if you have any doubt on the condition of items you received. *We choose high quality heat resistant synthetic fiber, natural and soft touch, bring you more confidence and charm. 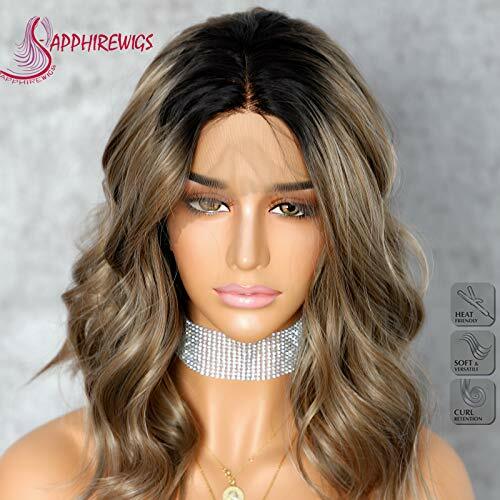 *Different wigs for your need, perfect for daily use, costume party, cosplay, concerts, theme party, dating or just for fun. How to Measure Head Circumference Using a soft tape measures, wrap it all around your head, keeping it at your hairline from ear to ear. At the front of your head, position in the center of your forehead. Specification: Length from crown to ends-Approx 13.8 Inches (+/- 1.2 Inches), Weight- Approx 220g (+/- 30g), Color-Mix Blue. 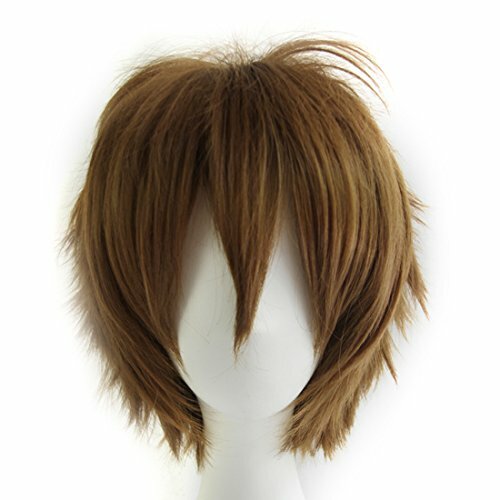 Importance Notice 1:Heat resistant temperature for this wig is: 150 / 302 (Maximum). Please kept it away from fire, do not iron or dye this wig if you are not professional. A little smell for the fiber is normal, you can wash it before the first wear. WATER RESISTANT Special non toxic polymer provides amazing holding power, completely water / moisture / humidity resistant. VERY STRONG HOLD Unlike some of the other brands, CLING utilized a specialized skin safe non toxic polymer that provides amazing holding power. NON TOXIC CLING is completely non toxic, so you get the best holding power without worrying about skin contact of this adhesive. WEAVE / FRONTAL / LACE / TOUPEE / etc. It will bond anything to your skin and keep it there with a firm hold. CLEAR It dries clear, you can control how firm you wish the hold to be, by adding additional layers of CLING prior to attaching the hair piece. 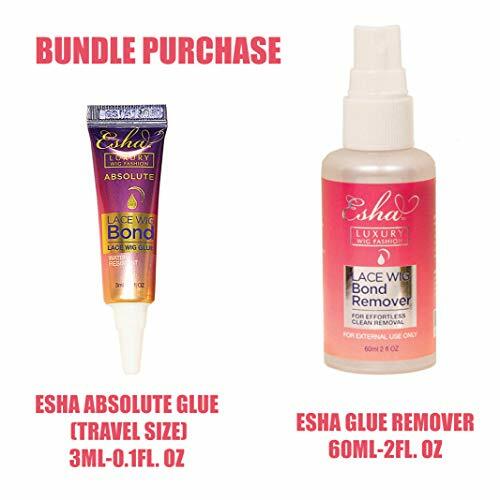 EDGESAFE Even though CLING adhesive's ultra bond has a bold hold and best bonding power, it comes off easily with the use of our Uncling remover solvent product. So it will slide off ONLY when you're ready and it is completely edge safe! 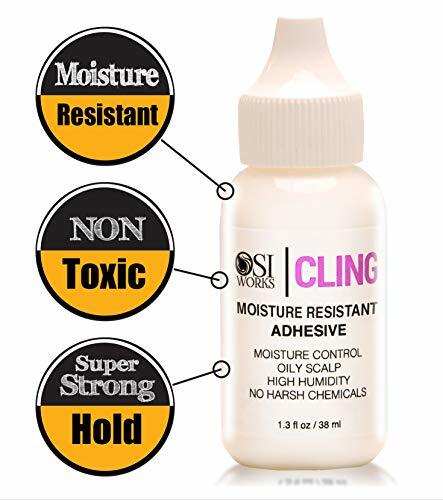 VERY STRONG HOLD Best Salon Quality Cling Adhesive provides professional bond control that holds like no other. Top quality poly provides lab extreme super holding powers far greater than other product systems including natural, latex, cream, electric, tape and other skin based systems. Control the strength of the hold by applying additional layers. DRIES CLEAR Cling by HerImports will drying to a completely invisible finish, it disappears like a ghost. 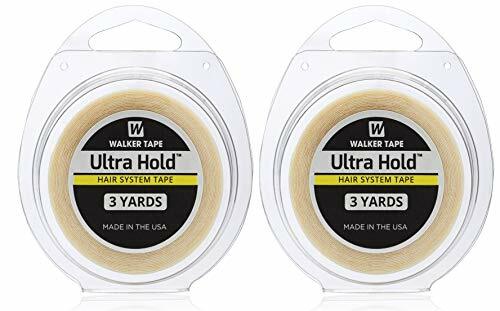 These ultra hold mini's by Walker Tape are just perfectly shaped for securing your wig or hairpiece to your scalp in a safe and easy manner. Package includes 36 strips of tape, 2 tabs per strip equally 72 pieces of tape in total. 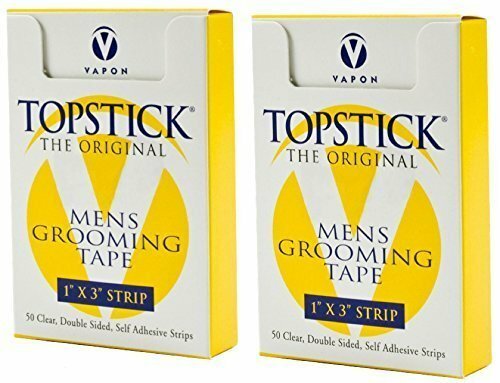 #1 HAIR SYSTEM TAPE | This is the number one hair tape on the market. It's versatile, long-lasting results will leave you satisfied and looking great all the time. LONG LASTING | Ultra-Hold Tape is the most tacky, flexible, and long lasting tape we make. Comparable to Super Tape, Air Flex, and GeoBond you will get the longest hold you've ever had from a tape. VERSATILE SHAPE | The mini shape of the tape is extremely versatile. Feel free to use it on the front hair line, the sides, the back, or wherever you want that consistent strong hold. Ultra Hold is our #1 Hair System Tape. Ultra-Hold Tape is the most tacky, flexible, and longest lasting tape Walker Tape Company makes. You will get the longest hold you've ever had from a tape. Not to mention the mini shape of it is so versatile. You can use Ultra Hold on the front hair line, the sides, the back, wherever you need a strong consistent hold. Maximum Wear (2-4 weeks) tapes are great for people who need a strong hold that gives them confidence. Ultra Hold tape is waterproof, so you can swim, shower, and live your life without worry of it letting go. Hairpiece & wig bonding tape. This tape is easy to remove using any adhesive solvent. 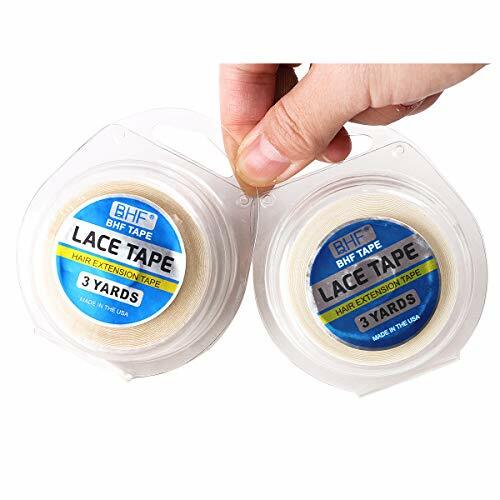 Leaves no adhesive residue on your lace. If you don't see the label as seen in picture, it is not Walker Tape Ultra Hold. VIP MERCHANTS' Tapes are always AUTHENTIC Walker Tape. Never generic. Ultra hold tape is the #1 Hair System Tape. Most Popular Choice for Long-lasting hold. Perfect for wigs, toupees and hair extensions. Dries Clear. Stays Strong. Ultra hold tape is the most tacky, flexible, and longest lasting tape Walker Tape Company makes. Super Tacky. Ultra hold is double sided. Very flexible. Easy to use. Waterproof. You can use Ultra hold on the front hair line, the sides, the back, wherever you need a strong consistent hold. Comes in attractive plastic protective case. 1 Remove the old tape and get rid of the remaining glues with glue-dispenser. 2 Change one piece new tape carefully and make sure the two tape appearances are dry and clean. 3 Wash your own hair and dry it completely before sticking the tape hair extensions, and remember hair conditioner is not allowed. 4 Please ensure the hair between the two tapes is proper amount and average so the hair and tapes can stick well. 5 Please wash the hair two days later after sticking the tape hair extensions onto your own head. Medical Grade Sticky Tape Which is Safe to Use on Your Skin. 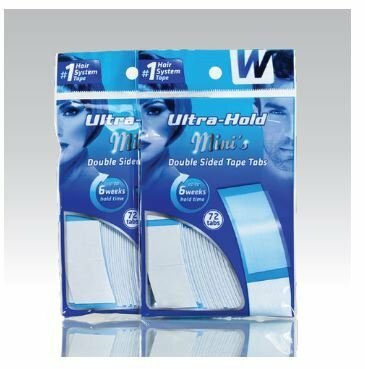 Strong Adhesive Water-proof Wig Tape. Clear.flexible. Easy to Use and Has a Quick Clean up. Perfect For Wigs / Lace Closure / Men's Toupee/Tape Hair Extension ,Other Places Where You Want to Stick. Maximum Wear (3-5+ weeks). Depending on Temperature, Humidity, and Body Oils, They can Last up to 6 Weeks. Yards Tape, 0.85cm Width, 2 Rolls/Set. The front side is to stick to the skin. Shampoo and hair conditioner PH 7 are advised. 4.When sleeping, please keep your hair tied in a loose ponytail way. 5.To keep the tape sticking longer time, please try the best to avoid touching the tape surface and ensure the fingers are quite clean. 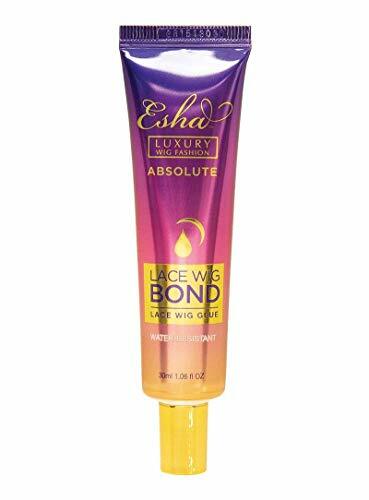 Strong and Durable - Long lasting adhesion, used for wigs. 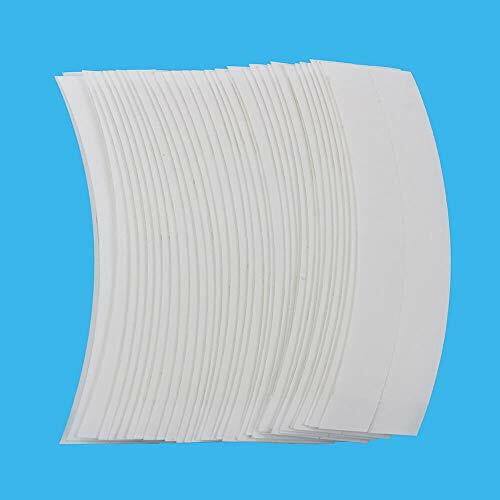 Useing - Comfortable and healthy on your head, double sides adhesive tapes,Easy to Stick and Wash.
Long Life Time - Maximum wear (2-4 weeks) tapes are the longest lasting tapes we make. Depending on temperature, humidity, and body oils, they can last up to 6 weeks. Strong water proof - You can swim, sleep and take a bath when wearing it. Professional-Suppliers of tape hair extensions/wig manufacturers.  If you can keep the surface is clean, you can reuse them Long time last.  This tape fits into the maximum wear category of tapes (up to 2-4 weeks) and are one of the longest lasting tapes we have available. Depending on temperature, humidity, and body oils, usually the most tacky, they require more skill to apply.  Above All: Consult Your Stylist with the appropriate training and expertise! We do not recommend applying or removing your Wig, Toupee / Hair System at home.  This tape fits into the maximum wear category of tapes (up to 2-4 weeks) and are one of the longest lasting tapes we have available. Depending on temperature, humidity, and body oils, usually the most tacky, they require more skill to Apply. Above All: Consult Your Stylist with the appropriate training and expertise! We do not recommend applying or expertise your Wig, Toupee / Hair System at home. 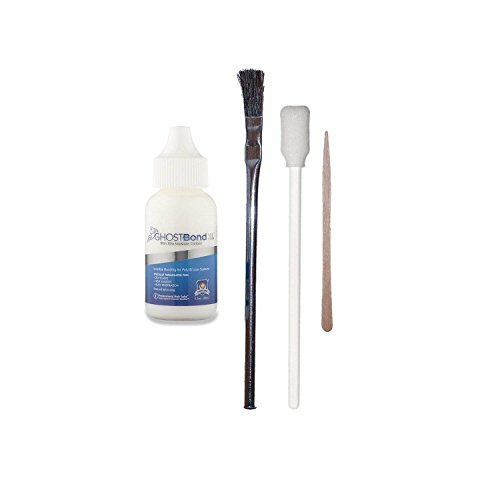 - Can be used for lace wig, toupee, closure, make wigs, lace front wigs and add hair to bad spots or repair hairline. 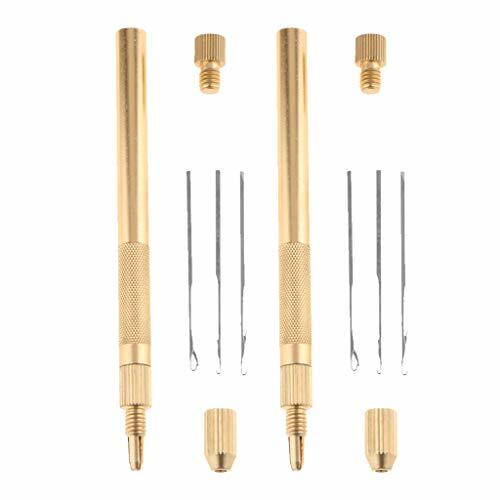 - Also Great for fast bead loading, string beads, micro silicone rings, feather installation etc. The Needle is in the back cover of the holder, please open it. Can be used for lace wig, toupee, closure, make wigs, lace front wigs and add hair to bad spots or repair hairline. 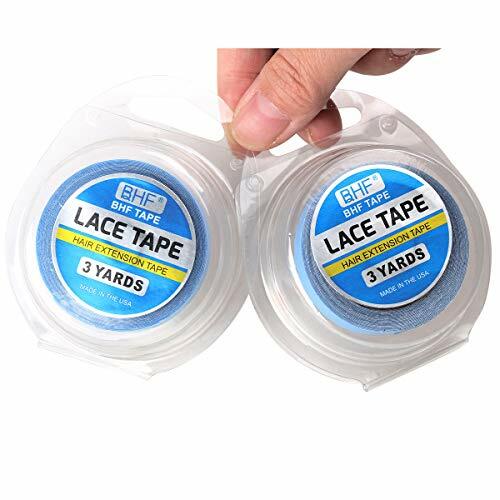 3 Yards Tape, 0.85cm Width, 2 Rolls/Set.